Ceramic Tile Advice Forums - John Bridge Ceramic Tile - FAQ: Advice Disclaimer -- Please Read This!! Listings of tile related industries. An inexpensive way to get your message out whether your prospect is around the corner, on the other side of the U.S. or the other side of the world. A must place for regional, national and international companies to have a presence. Maximize your reach through the worlds busiest tile and stone website. For complete information on our other advertising programs please click here. LATICRETE MULTIMAX LITE: The ultimate, lightweight one-step, polymer fortified, Large and Heavy Tile mortar for interior and exterior installation of ceramic tile, porcelain tile, stone, quarry tile, pavers and brick. For over 15 years, StoneTooling.com has taken pride in offering a wide selection of products at low prices. Our friendly and knowledgeable staff makes sure customer service is the number one priority. Our strong relationship with companies like Dupont StoneTech, Miracle Sealants, Custom Building Products, MK Diamond and Laticrete (amongst many more) give us the ability to stand behind everything we sell with full manufacturer support. Feel free to visit us at www.stonetooling.com, call us at 888-965-6577, or email us at store@stonetooling.com for more information. Organized and chartered in 1947, the National Tile Contractors Association (NTCA) is a non-profit trade association serving every segment of the tile and stone industry, and is recognized as the largest and most respected tile contractors association in the world. The entire industry benefits from our efforts. We include manufacturers, distributors, contractors, architects, designers and builders in our programs. We firmly believe that manufacturers producing quality products, sold by trained and reputable distributors, and professionally installed by qualified contractors for satisfied customers, result in growth and longevity for our industry. NTCA members take pride in being a part of an association that has spearheaded education for the professional installation of ceramic tile and allied products. We have dedicated our Association, people and resources to the betterment of the ceramic tile and allied industries and are engaged in a wide variety of activities on behalf of our members and our industry. NTCA's goal for our members is to assist them in growing their business. NTCA's member products and services speak to each area of the tile contracting business from the installation side to the business side. Our real time technical assistance can give the contractor real time advice on the job. NTCA has a jobsite safety program. NTCA also offers marketing programs. insurance programs and best business practice programs. Become an NTCA member and see what we can do for you. Prism® sets a new standard in cement based grout technology. Prism’s calcium Aluminate cement based formula offers consistent color with no shading regardless of tile type, temperature or humidity. Comprised of a unique blend of lightweight recycled glass and fine aggregate sand, Prism has a smooth consistency that is easy to spread and clean. Best of all, the formula eliminates the potential for efflorescence. This rapid setting formula results in high early strength and is walkable in just 4 hours. Prism produces hard, dense joints for the highest stain resistance and can be used for all grout joint sizes up to ½”. Consider this the no call back grout. Available in 40 colors. To learn more visit our website at CustomBuildingProducts.com. 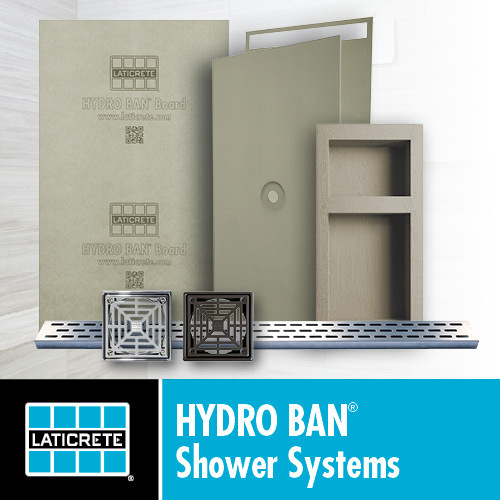 Mark E Industries has created 8 shower installation products to simplify the art of shower and tile installation by focusing on some of the industries more difficult and time consuming tasks. Tools that will save the installer the valuable time required to complete such tasks, without the problems that can occur with traditional methods. Shower installations and installing a shower particularly installing a shower pan is now easy, less time consuming, less expensive and GOOF PROOF. Our products will assist not only the professional contractor, remodeler and proficient do it yourselfer but anyone who is looking to create a tile shower installation of any size or shape with consistently perfect results every time! MAPEI is a company that listens to contractors to find out what they need to do the best job. We take that information to our R&D labs, where innovative new products are developed to meet those needs. We’ve been doing this globally for 75 years; and over that time we have brought to the market mortars, grouts, waterproofing products, crack isolation and sound reduction membranes, self-leveling underlayments and other surface preparation products that get the job done. One of the newest products from MAPEI is ECO Prim Grip™, a primer that lets installers apply tile-over-tile without scarifying the original porcelain tiles. Select MAPEI tile and stone installation products are certified for environmental sustainability by an independent third party laboratory and are listed on the Collaborative for High Performance Schools (CHPS) database. We also offer the best-backed warranties in the business to give contractors peace of mind when they use our products. To learn about MAPEI’s tile and stone installation systems in more detail, click here. To get technical support for your installations, call 1-800-992-6273 (US and Puerto Rico) or 1-800-361-9309 (Canada).